Once in a generation does a new luxury hotel grace London’s world-renowned enclave of Knightsbridge. Even more exceptional is the opportunity to acquire a Knightsbridge residence in an iconic hotel that bears the Bulgari name. “The Bulgari name stamps this opportunity to own in Knightsbridge with international provenance and a promise of excellence,” says Giles Hannah, Director of European Sales for Christie’s International Real Estate. “The Christie’s and Bulgari brands, two respected luxury imprimaturs are certain to resonate worldwide and further elevate the stature of this offering in London.” Giles Hannah also adds, “With only six residences available in a phased release and one penthouse remaining, this is a truly rare proposition unlike any other in central London.” Two Bulgari hotels exist globally-one in Bali and the other in Milan. Both are distinguished by exquisite concierge service, unparalleled architectural and design achievements, and a heritage of understated elegance and excellence. The same architect who lent his artistic vision to Bulgari’s Bali and Milan hotels, Antonio Citterio, also leads the London project. The architecture adheres to strict environmental building aesthetics, without compromising luxury, and including a rooftop habitat which preserves London’s treasured urban wildlife. 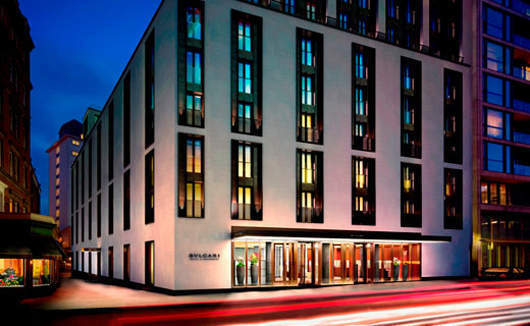 Developed by Prime Development Ltd, the Bulgari Hotel and Residences, London, are located near renowned shopping and cultural attractions such as Harrods, Harvey Nichols, the Royal Albert Hall, the Natural History Museum as well as Hyde Park.